You’ll need a couple of basic tools, like these Frankford Arsenal calipers and Hornady beam scale. Getting started in reloading is kind of like equipping the kitchen in your first apartment. Sure, you can go primitive and start with only a cast iron frying pan, or if you’re an expert in college dorm cooking, an electric hot pot. While you can make everything from Cajun steaks to corn bread with a good skillet, it helps to assemble a basic set of tools that provide convenience and menu variety. Like cooking, you could reload cartridges with just a couple of tools, but it wouldn’t be easy or safe. Or, you could buy the entire Sinclair Reloading inventory and spend a couple hundred large on all the fancy gear and accessories. You know what they say, right? Reloaders do it with hand tools, so let’s take a look at the basic set of hand tools that will make your reloading faster, safer and easier. For simplicity, we’ll assume you’re reloading centerfire rifle and pistol ammo. You can reload shotshells too, but it requires some different gear. For purposes of this list, we’ll assume you have a single-stage reloading press. While there is such thing as a hand press, a standard table-mounted reloading press is the one must-have item, like a stove in your first kitchen. While it sounds like a brake part for an old Buick, calipers are just a tool to measure things. In this case, reloaders need to measure things like overall length of a completed cartridge or the length of a resized brass rifle case. Calipers are available in both old and new school formats. The most important measurement you’ll need to worry about is the overall cartridge length. If the overall length is too short, that means the bullet it pushed into the case too far. That means there is less volume inside where the powder is. Less volume means more pressure when you torch it off. If a bullet is seated too far in, pressure can reach dangerous levels and blow up your gun, and whoever is holding it at the time. 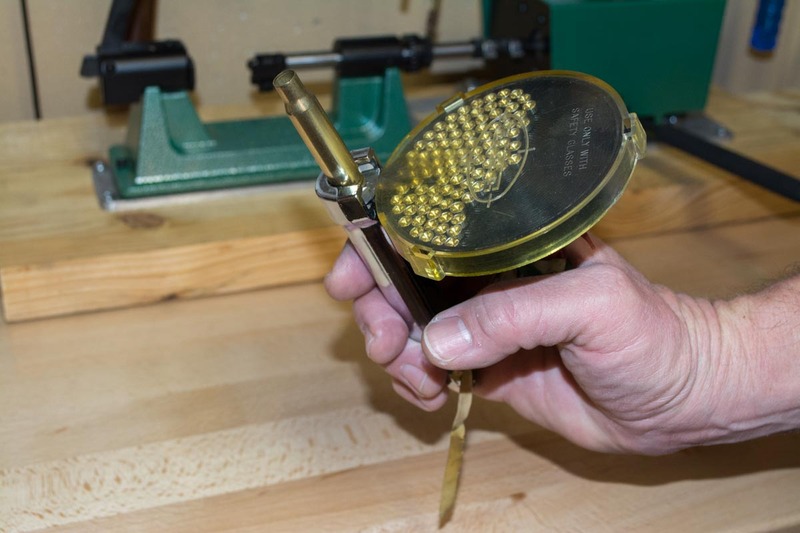 If you are going to reload bottleneck rifle cartridges, you’ll also need calipers to make sure that your resized cases are the proper length before you start to seat bullets. Cases tend to stretch a bit when you fire and resize them. I have both digital and analog calipers and have found both to be more or less equally accurate and reliable. Of course, you have to worry about changing batteries with the digital type, but they’re a lot easier to read. With analog calipers, you have to look at both the slide and dial to get the entire reading in inches, tenths, hundredths, and thousandths. Prices range from $35 at the low end to a couple hundred for the really precise ones. Many single stage reloading presses have a built in way to seat (push primers into the primer pocket holes) primers. You can certainly do this. You can also rub your cornea with sandpaper, and that’s equally satisfying. This Lee hand priming tool uses special shell holders for each caliber. When starting out, a hand priming tool is a great way to ramp up the speed of ammo production. Most hand priming tools are a simple squeeze tool like a pair of pliers or a grip strength exerciser. There’s usually a tray to hold a bunch of primers and feed them one at a time into a holder for the cartridge. Apply a squeeze and the device presses the primer into the primer pocket. You can easily do hundreds of cases per hour this way. Better yet, you can do this from the comfort of, well, just about anywhere. “Hand priming tool” is a literal descriptor, and most of them are small, light and portable. Want to camp out in the family room? No problem, bring a box of cases, your priming tool and an empty box for your completed cases. One other thing to be aware of: some hand priming tools use the same shell holders that your reloading press uses. Others require special shell holders. Recently, I’ve been using the RCBS Universal Hand Priming Tool. It’s sturdy, easy on the hands and doesn’t require specific shell holders. Spring loaded clamps center most any cartridge case you use.